Order this book today from According To Prophecy Ministries online bookstore. 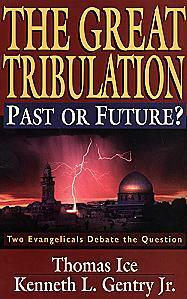 THE GREAT TRIBULATION PAST OR FUTURE? "False Christ in the last days"
According To Prophecy Ministries & Evangelist Perkins, brings you articles from some of his colleagues in Bible Prophecy. He has also included the email addresses of the authors at the bottom of their articles, please email the authors and let them know what you think of their articles.
" I believe that salvation comes by grace through faith (Ephesians 2:8) and not by some arbitrary choice of God, for God is no respecter of persons (Acts 10:34). I believe that faith comes through hearing the Word of God (Romans 10:17) and that saving faith is always evidenced in the fruit of the Spirit (Galatians 5:22-23) and in good works (Ephesians 2:10 and James 2:14, 20, 24, 26). As Haddon W. Robinson has put it, "Just as thunder follows lightening, good works always follow true faith. We are saved by faith alone, but faith that saves is never alone." How Does It Relate To Prophecy? A book by Joseph C. Dillow entitled, The Reign of the Servant Kings,1 has caused a considerable stir in theological circles. Although it deals primarily with the issue of eternal security, it contains some major prophetic implications � which is the reason I have decided to review it. Dillow asserts confidently that he has found the solution to the age old conflict between Arminians and Calvinists. His book left me totally unconvinced. The book is anything but a joy to read. It is long winded, repetitious and tedious. It is also painful to read because it is full of agonizing attempts to explain that the Scriptures do not mean what they say. Dillow is a Calvinist. In fact, he is really a hyper-Calvinist because he believes that even Calvin was not true to his fundamental propositions. Incredibly, he accuses Calvin of teaching salvation by works! Dillow asserts that both views constitute works salvation, and therefore, both are wrong (p. 383). Interestingly, even though he is a Calvinist, Dillow states that "if one had to choose between Arminian and Calvinist interpretations of the relevant passages, the writer�s opinion is that the Arminian view is eminently more successful and true to the text" (p. 14). He goes on to say that, fortunately, one does not have to chose between either of the interpretations because he has developed a third approach that he believes is the biblical and "mediating path" (p. 14). From that point on Dillow pretty well ignores the Arminian viewpoint. The rest of the book consists of a withering attack on traditional Calvinism because of its assertion that a truly born-again person will persevere to the end. What Dillow proceeds to do is carry the fundamental assumptions of Calvinism to their logical absurdity. 1)	God has predestined who will be saved and lost. 2)	Those predestined to be saved are saved without condition � not even faith or repentance is required. 3)	The faith of those saved (if any) is a gift of God, not an act of will, because Man is too depraved to exercise faith on his own. 4)	Faith and obedience are not related, therefore faith does not necessarily produce obedience. 5)	Since the saved are saved, there is nothing they can do to lose their salvation. 6)	To argue that the fruit of the Spirit must be manifested in their lives as evidence of their salvation is to argue they are saved by works. 7)	A saved person can live a life of debauchery and still be saved. In fact "a saved person can even publicly renounce Christ and persist in sin or unbelief to the point of physical death and still be saved" (p. 311). If you consider the last point above to be shocking, consider this statement: "Apparently, true Christians, due to their sin, can �have no part� with Christ (John 13:8), can be unforgiven (1 John 1:9), and can be outside His love" (John 15:10). He reaches this astounding conclusion because he says that none of the scriptures noted in parentheses apply to unbelievers. 1)	Matthew 25:12 � "Truly, I say to you, I do not know you." Dillow argues that all this statement means is "I do not appreciate you," but it certainly does not imply that those to whom it is addressed will be shut out of heaven (pp. 389-396). 2)	Matthew 22:13 � "Bind him hand and foot, and cast him into the outer darkness; in that place there shall be weeping and gnashing of teeth." Dillow denies that these words relate to the unsaved or to a person who loses his salvation. He argues they were spoken to a saved person who will live eternally in heaven! The "outer darkness" is not Hell; it is just the "darkness outside" the banquet hall where the marriage feast of the Lamb will be held (between Jesus the bridegroom and His bride, the Church). "No literal darkness . . . is intended," says Dillow. The "weeping and gnashing of teeth" is just hyperbole for the profound regret that certain sinful Christians will experience when they are not allowed to participate in the wedding feast. It just means they will be standing on the outside of the banquet hall looking in (pp. 350-351). I am not making this up. I know it sounds like Alice in Wonderland, but hang on, because it gets even stranger. Dillow realizes the repulsive nature of what he is advocating, and he anticipates that many will be tempted to toss his book in the fireplace. So, he writes, "It is possible that part of the problem [of not believing his theory] is that many assume that it is faith that saves us. If that is so, then if we stop believing, we would no longer be saved" (p. 354). And all the time I thought the Apostle Paul said we are "saved by grace through faith" (Ephesians 2:8). Dillow can�t quite make up his mind on this point. In one place he argues that the way to discern a true Christian is to ask him theological questions! For example, he proposes asking if the person is trusting in Christ or something else (p. 284). But in other places, he says a person can be saved who has renounced Christ! So, he finally ends up arguing that we should stop trying to discern who are true Christians because it is really impossible to know. After all, he points out, "a total unbeliever can live a long life full of good works" (p. 308). And what about the Christian who ends up renouncing Jesus as Savior and Lord? Can such a person die in unbelief and still be saved, as Dillow asserts? Not according to the Bible. Paul wrote, "If we deny Him, He also will deny us" (2 Timothy 2:12). Where is the biblical proof that unrepentant sinners can be saved? Dillow points to Saul and Solomon! He argues that since Saul was once saved, he was always saved, and that continued to be true even when he ended up turning his back on God, living a carnal lifestyle, trafficking in demons, and committing suicide. In his summation of Saul�s life, Dillow never bothers to point out that God specifically withdrew His Holy Spirit from him (1 Samuel 16:14). I believe this withdrawal was a clear indication of Saul�s damnation. I believe David realized this, and I believe that�s the reason that, following his adultery with Bathsheba, he cried out to God: "Do not take Your Holy Spirit from me!" (Psalm 51:11). Because of David�s sincere repentance, God did not withdraw His Spirit from him. Regarding Solomon, Dillow points to the fact that he wallowed in sin and became a rampant idolater, yet he argues he must have been saved because "he wrote three books of Scripture which reveal divine wisdom available only to the regenerate mind" (p. 319). Again, Dillow conveniently forgets to mention that Solomon repented before he died, calling his lifestyle "empty vanity," and calling on his heirs to "fear God and keep His commandments ... for God will bring every act to judgment . . ." (Ecclesiastes 12:13-14). What will be the fate of those who are saved but who refuse to repent? According to Dillow, it will be a slap on the wrist compared to the fate of the lost who will be consigned to Hell. The unrepentant saved will suffer from the consequences of their sins in this life. After death, they will suffer embarrassment at the judgment seat of Jesus when they receive no special rewards. They will be excluded from participating in the marriage feast of the Lamb. And they will not be allowed to participate in the Millennial reign of Jesus (pp. 341-351). But when the Millennium concludes, and the Eternal State begins, with the redeemed living in a new Jerusalem on a new earth, the carnal, disciplined Christians will be restored to full fellowship in God�s kingdom, and He will wipe away their tears (p. 531). In other words, Dillow constructs a sort of Protestant Purgatory for the "unrepentant who are saved." They will be cast into darkness, experience deep regret, and be denied participation in the Lord�s reign. Then after having been punished for their lack of repentance, they will be restored to full fellowship. Dillow asserts that those unfaithful Christians who never repent in this life will do so at the judgment seat of Christ when every knee will bow. "And, having confessed their sin, they, like the prodigal son, will be restored to eternal fellowship with their King" (pp. 530-531). If that doesn�t constitute second chance salvation after death, then I don�t know what does! Dillow concludes that all Christians are heirs of God, but not all are co-heirs with Christ (p. 553). Only those who repented in this life and lived obedient, faithful lives will partake in the Millennial reign of Jesus. They will be the super-saints, whom Dillow refers to as "The Partakers" (p. 585). In my opinion, Dillow�s theology blasphemes the Holy Spirit by holding that spiritual regeneration can be so inadequate that it may never be manifested in any way in a person�s life. It turns God into a monster who saves arbitrarily, regardless of faith, repentance, obedience, or perseverance. For all we know, from Dillow�s perverted theology, Hitler was saved! Finally, his theology reduces Man to a helpless victim of God�s arbitrary selection and renders his moral choices meaningless. This is a theology that makes a mockery of what Christianity is all about. Dillow�s preposterous concept of salvation reminds me of an incident in Alice in Wonderland when Alice tells the White Queen that her statements are impossible to believe. "One can�t believe in impossible things," Alice complains. To which the Queen replies, "I daresay you haven�t had much practice. Why sometimes I�ve believed as many as six impossible things before breakfast." I believe the predestination of God means that those who respond to His grace through faith are predestined to be saved (John 6:40). I believe God has both a perfect will and a permissive will. In the Scriptures this is illustrated in the fact that "God does not wish for any to perish, but for all to come to repentance" (2 Peter 3:9). Yet, He is willing to allow those to perish who do not respond to Him in faith and repent (John 3:36). Man�s free will operates within the boundaries of God�s perfect will and His permissive will. I believe God created Man with free will, and just as a person can decide whether or not to accept Jesus as Lord and Savior, that same person can decide whether or not to continue trusting in the Lord. In other words, I believe a person can stop believing (John 15:2, 6, Romans 2:6-8, Colossians 1:22-23, Hebrews 10:26-27, and 2 Peter 2:20-21), and I believe that if a person stops believing, that person is no longer an heir of salvation. As Dillow himself expresses it, "If [faith saves us], then if we stop believing, we would no longer be saved" (p. 354). I really do not have any great problem with traditional Calvinism, even though I disagree with it.5 The reason can be illustrated in the following story. Suppose there is a reprobate who stays drunk, can�t hold a job, cheats on his wife, and abuses his kids. One day he hears the Gospel and responds in faith, accepting Jesus as his Lord and Savior. His life is transformed. He stops drinking and starts treating his wife and children with respect. He gets a job, pays off his bills, and becomes a respected member of his community. Then, one day, many years later, he falls off the wagon, loses his job, deserts his family, and ends up lying in a gutter choking to death on his own vomit. The traditional Calvinist would say that because he failed to persevere, he was never saved in the first place. The traditional Arminian would say he fell from grace. Both would agree that he went to Hell. So, when you get to the bottom line, the traditional Calvinist and Arminian both agree. I was raised in a hyper-Arminian church that taught a person could be saved one moment and lost the next and then be saved again. Every sin resulted in spiritual death. We were spiritual schizophrenics, never knowing whether we were saved or not. We believed that if a person died with one unconfessed sin on their conscience, they would burn forever in Hell. Needless to say, I never yearned for the return of Jesus, for I was afraid He would come on one of my bad days instead of one of my good days! I praise God for the day I discovered I could be sure of my salvation � when I discovered there is no condemnation for those in Christ Jesus (Romans 8:1); that there is a continual cleansing from sin for those who are walking in the light (1 John 1:7); that God has forgiven and forgotten my sins (Hebrews 8:12); that I can know that I am saved (1 John 5:13); and that I can have confidence regarding the day of judgment (1 John 4:17). But my confidence and my assurance is based on a faith relationship that must persevere to the end of my life (Hebrews 3:14). Does that constitute works salvation? Not at all. I was justified by grace through faith. My sanctification is occurring in the same way, by walking in faith, trusting in Jesus and allowing His Holy Spirit to shape and mold me. Salvation from beginning to end is a work of grace through faith, but it is a process that I must allow through my free will and my faith. God is not manufacturing robots. He is developing relationships. Praise God for His glorious grace expressed in the gift of His precious Son who died for our sins! 1. Joseph C. Dillow, The Reign of the Servant Kings (Hayesville, NC: Schoettle Publishing Co., 1992) 649 pages. 2. For a comprehensive presentation of the radical Arminian view, see The Believer�s Conditional Security, by Daniel D. Corner (Washington, PA: Evangelical Outreach Publishers, 2000) 801 pages. This book is as extreme as Dillow�s, but in the opposite direction. It is thorough and thought provoking, but it is very mean-spirited. The author often seems to be more interested in vilifying the people he disagrees with than in dealing with their arguments. 3. I think it is interesting to note that although the Calvinist doctrine of "Once Saved, Always Saved" has been identified in the popular mind primarily with Baptists, two of the most profound books of the 20th Century which advocated the Arminian viewpoint were both authored by Baptists. The comprehensive one that has become a classic is entitled, Life in the Son (Springfield, MO: Westcott Publishers, second edition, 1961) 380 pages. It was written by Robert Shank, a Baptist pastor. The book contains a lengthy introduction that was written by Dr. William W. Adams who was Professor of New Testament Interpretation at The Southern Baptist Theological Seminary in Louisville, Kentucky. In that introduction, Dr. Adams states, "I consider Life in the Son one of the most significant books in this generation. I consider it possible that the judgment of time may prove it to be one of the most important books ever written." 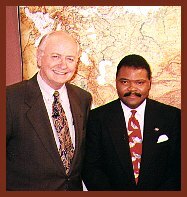 The second book, written by Dr. Dale Moody, was a commentary on the book of Hebrews. It is titled, Apostasy: A Study in the Epistle to the Hebrews and in Baptist History (Macon, GA: Smyth & Helwys Publishers, 1997) 84 pages. Dr. Moody was a professor at The Southern Baptist Theological Seminary when he wrote this book. 4. Haddon W. Robinson in an article entitled "Lightning and Thunder," from Our Daily Bread (March, April, May 2000) published by RBC Ministries of Grand Rapids, MI. It is the devotional article for Saturday, March 11. 5. An excellent presentation of the traditional Calvinist view can be found in The Gospel According to Jesus by John F. MacArthur, Jr. (Grand Rapids, MI: Zondervan Publishing House, revised edition, 1994) 304 pages. This book infuriated the hyper-Calvinists who quickly dubbed MacArthur�s thesis as "Lordship Salvation." 6. Modern teachers who hold to Dillow�s extreme Calvinism (but who may not agree with all his prophetic conclusions) include Charles Ryrie, Charles Stanley, and Bob George � among others. 7. For warnings against possible apostasy by believers, see: Romans 8:12-14; 1 Corinthians 15:1-2; Galatians 5:16-24; Galatians 6:7-9; Philippians 2:12; Colossians 1:21-23; 1 Timothy 4:1, 16; 2 Timothy 2:12; Hebrews 3:6, 14; James 1:12-16; and 1 Peter 1:17.